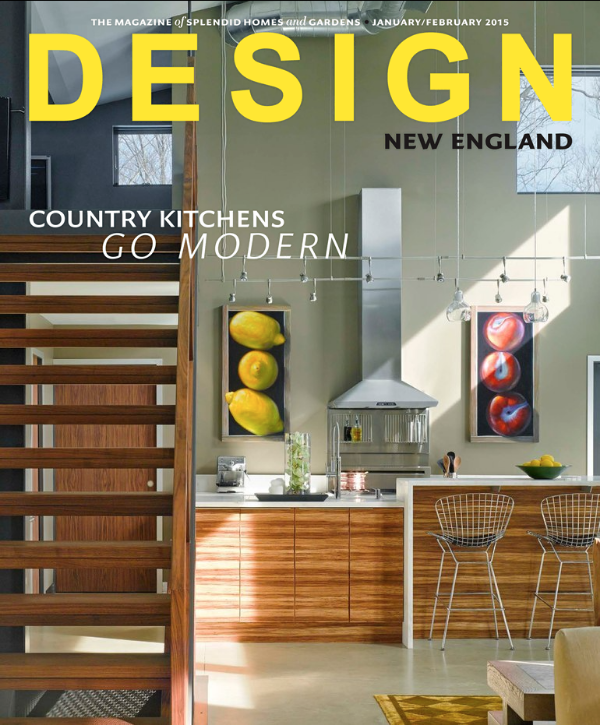 Our Autumn Hill Lane house is on the cover of the January/February 2015 issue of Design New England. Inside there is a great article about the house written by Kathleen James that captures the design story behind this house. The article also provides a good description of the main features of the house which include not only the visible design elements such as the modern materials, abundant natural light, open plan and clean lines, but also the quality of the construction and energy-efficiency of the design. Thanks to Kathleen and the staff of DNE for this feature article, and to Jim Westphalen for his beautiful photography. We are pleased to announce that our Autumn Hill Lane house received a citation award from AIA Vermont this year. This year's AIA VT award entries were juried by a committee from AIA Wyoming and the awards were presented at the annual AIA VT dinner this week, held at the State House in Montpelier. A total of eight projects received awards this year and we are honored to be among those chosen. There were many great projects entered, confirming that Vermont continues to create quality architecture. Thanks again to our clients, the crew from Leach Construction of Vermont, and the many artisans and craftsmen who worked so hard to make this building possible. A final thanks to Jim Westphalen for his photography. What a difference thoughtful design makes! While our clients (a busy family of four) initially came to us for a new kitchen, we learned there was more to the story. Working closely with this family we began to understand the many ways in which their existing spaces did not function as well as they could for them. The renovation became both an aesthetic and functional overhaul of the main floor of the house. Without changing the footprint (size) of the house, the spaces feel larger and work better as a result of the new design. The kitchen was relocated to the corner of the first floor where it is directly connected to the family room and dining space. Careful space planning allowed for the addition of a walk-in pantry, larger mudroom and a separate powder room and laundry room. A consistent palette of light, neutral colors creates a bright, cohesive and welcoming series of interior spaces. 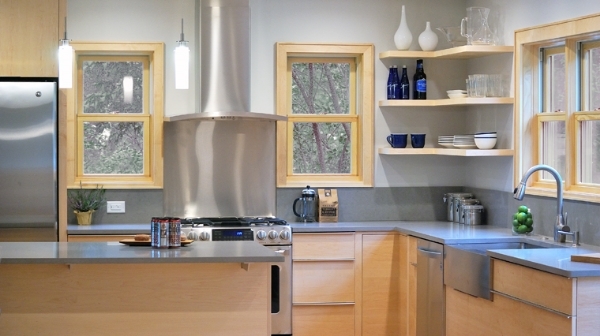 The new kitchen features custom maple cabinets and gray quartz countertops. As time allows, we work in our studio on pieces of a smaller scale than the buildings we generally focus on. On the surface these smaller pieces have little in common with our architectural work. In reality, however, they provide us with another way to think about many of the themes and ideas that filter through our buildings. Connections, material properties, possibilities, craftsmanship, form and function all come into play at both scales. In addition, we have a chance for some 'hands-on' making, remembering again the challenges and opportunities that come from the effort to make something that is both thoughtful and well-crafted. These fruit bowls are a recent example, made carefully by hand in our studio from eco-resin and aluminum. Brown + Davis Design is on social media! Follow us on Houzz and Instagram and like us on Facebook to see additional images of our work, keep up with the latest news from the studio and learn more about us! As architects we work in a profession that is highly collaborative in nature. Despite the painstaking thought and detail that we put into our construction documents, they are still only drawings. We rely on the builders we work with to bring our vision to reality. We are fortunate to live in Vermont where we are surrounded by a network of highly-skilled and dedicated craftsmen to work with. The stuff we build with is big and heavy. Making the pieces all come together is not easy and requires a combination of heavy equipment, hard work and attention to detail. Thanks to all the great craftsmen we have the pleasure of working with!! Our Autumn Hill Lane house received two HBRA awards: the People's Choice Award for Best Overall Project and the Energy Star Energy Efficiency Award. Thanks to Leach Construction of Vermont for their great work on this project and for submitting it to the HBRA awards program. Photo by Jim Westphalen. Construction is nearing completion on this renovation project. All of the cabinets and built-ins have been installed, including a dropped wood soffit above the kitchen island, a built-in banquette bench with wall panels and ceiling soffit at the dining table and a wall of bookshelves and entertainment cabinet in the living room. 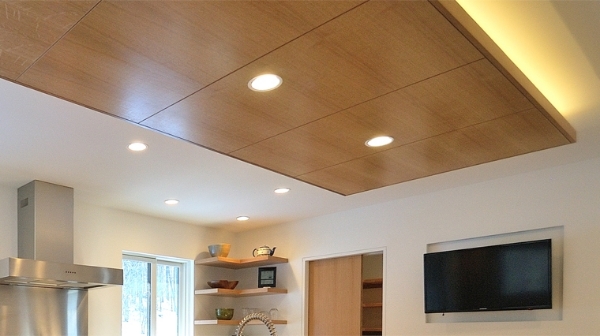 All of the woodwork is custom-made locally from quarter sawn white oak. 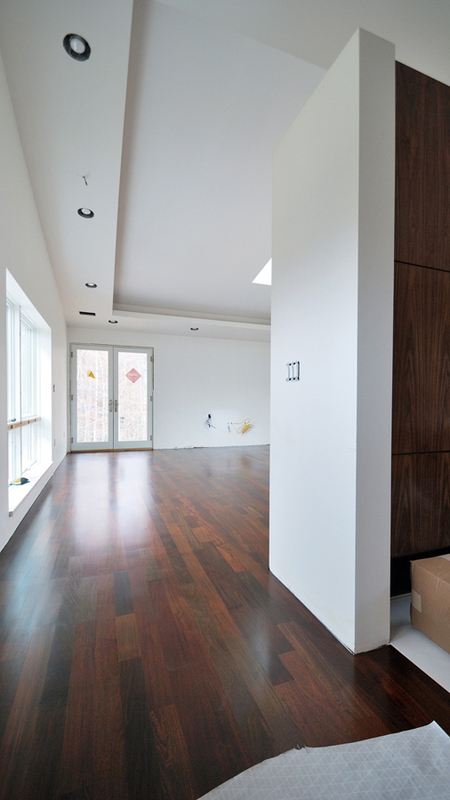 The new flooring is also white oak with a clear oil finish. There is a new blackened steel wood storage unit and surround for the wood stove in the living room. The countertops are white marble from Vermont, being installed this week. The resulting interior spaces are unified by the simple warm palette of materials and colors and feature abundant natural light and open sight-lines. Its exciting and rewarding to see these spaces come to life. Thanks, as always, to the great craftsmen who have worked to make this happen. Construction is underway for this renovation project on Turkey Lane. The focus of this project is the main floor of the house, including the kitchen, dining and living spaces. Existing walls have been removed and new windows added to open up the interiors, add light and enhance the connection to the surrounding country setting. Interior materials will include quarter sawn white oak cabinets, locally-sourced white marble and charcoal-gray slate. A few recent images of this exterior stair. The stair is suspended from the Douglas Fir beam above on stainless steel rods. The stringers were water jet cut and then had channels welded on to receive the stainless rods and to hold the treads. 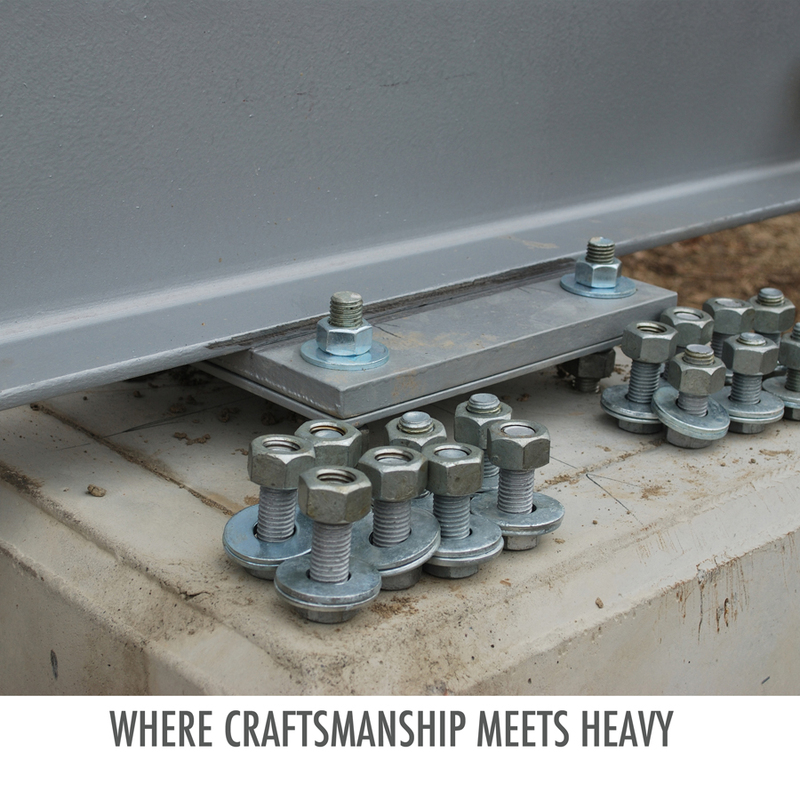 The treads are individual pieces of Ipe held together by stainless steel rods. Another example of the great craftsmanship and attention to detail that has characterized the work on this project! A few progress shots of this outbuilding designed for an active family of four. Modern details include a standing seam metal roof that wraps down one face and cantilevers out over the opposite, south face for solar shading. The remaining exterior materials include Eter-Color cement board siding, galvalume corrugated metal siding, polished concrete and Douglas Fir. The large covered concrete porch faces an outdoor firepit and seating area, expanding and enhancing the opportunities for outdoor living behind the existing house. The simple shed roof slopes up toward the south end of the pod and allows for large south facing windows and an interior loft space. What a pleasure it is to work with great craftsmen. There are few things more satisfying for us as architects than to see one of our designs built with care and attention to detail. The stair for the Clark Road project is a great example. The clean lines and simple palette of materials make for a sculptural stair that complements the interiors of the house. The craftsmanship brings it to life, enhancing the clarity of the design intent. Thanks to Steve, Will, Zach and Ben for their efforts on the wood components of the stair, thanks to Mike and his crew for the great sheetrock work and thanks to Bob for the excellent painting. Progress moves along steadily on this project. Most of the interior walls of the main living spaces have been removed, proving once again that less is more. In this case, fewer walls means more light, more views and more connections between the spaces. To enhance this affect we added new windows on the east and south sides of the house. The result is an interior that is filled with natural light and that allows for the sweeping panoramic views available from this hill-top site. At the same time, we have added new insulation to the building shell and in this case, more is definitely better. The entire roof now has new ventilation under the sheathing (created with a layer of rigid insulation), new blown-in dense pack cellulose insulation and a new layer of rigid insulation on the bottom face of the rafters for a continuous thermal break. Where we have worked on the exterior walls, we have replaced the existing fiberglass batt insulation with new blown-in dense pack cellulose insulation. All told, these changes will make for a much more livable house and will result in a drastic reduction of annual energy usage. Thanks to Jim Bradley of Caleb Contracting for the initial energy assessment, recommendations and follow-thru with the insulation and air sealing work. 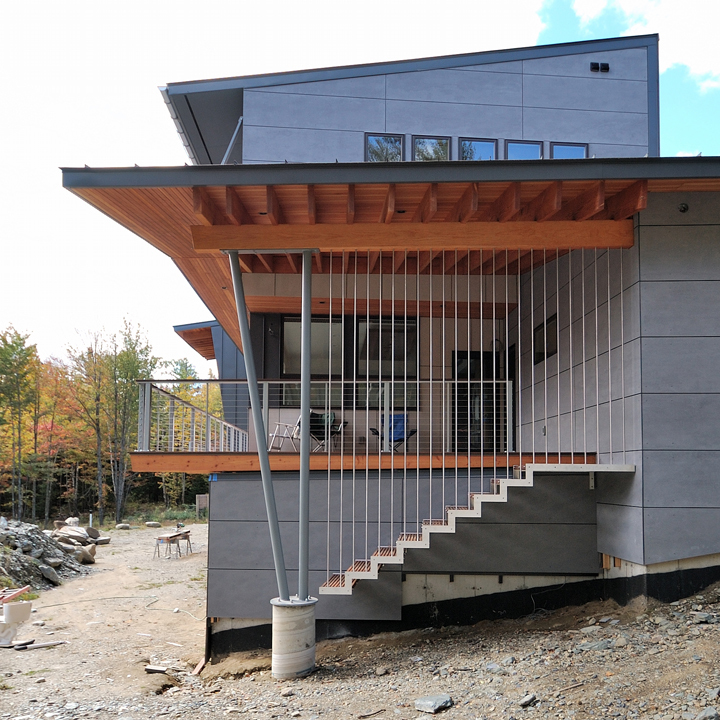 Finish materials are being installed inside this modern Vermont house and it is great to see the interiors coming to life. The floors are Ipe, a Brazilian walnut, with a dark ebony stain. This Ipe has a beautiful, earthy richness with a surprising amount of color and variation. The interior spaces are flooded with natural light which now glows as it is reflected off the colorful floors. The white walls and ceilings add to this affect, reflecting the light back into the spaces. The custom-made walnut cabinets are being carefully fitted into place throughout the house now as well. (Thanks to Mark and Louie for their great work on these.) Shown here are some images from the kitchen (where the wall oven, cooktop and refrigerator will be) and the master bathroom (featuring a floating vanity cabinet). Check out more images of this modern house here.